Hello @leokhoa, thanks for your support. I do a facepalm to myself, because the sql_mode was overwritten waaaay down in the my.ini file so my setting that was set almost at the top was overwritten. Sorry for bothering you. Now everything works fine. @leokhoa Today is a new day, and what do I have to see? it seems, that Laragon (or whatever) does not remember the setting I applied in phpMyAdmin and resets the sql_mode every time I start the MySQL service. Please help. It is very annoying that I have to set the SQL Mode every day for new. @leokhoa That also did not help. I have an old app written for MySQL. After using the app with Laragon and MariaDB I got errors saying "Field x has no default value" when I tried to insert something into the database. 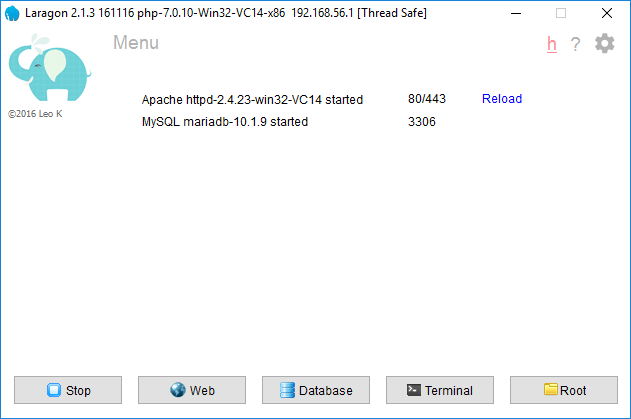 To fix this, and use the old MySQL behaviour I had to set SET @@global.sql_mode= '' in phpMyAdmin. Adding sql-mode= '' to the my.ini did not help. RE: Laragon is really great! Thank you for this great tool. Using it every day and feel so happy to have it. No more mangling with Virtual hosts, thanks to Laragon. It´s a great piece of software. I love it. Thank you for all your efforts. Thank you for this great and quick update. You rock! I also miss this option. It should be in the tray just when it starts, if you checked the option. RE: How to disable or change STRG-ALT-T shortcut? Cool. Thank you for doing this.